Stone who have established a name for their song series including embracing long-needed projects, such as the output of C.W. Orr, here branch out in unaccustomed directions. A Room is an insistent little minimalistic mood piece. The Three Easy Pieces are amicable diminutives. There is no obstacle to cool enjoyment and any fears about Cage and the avant-garde are misplaced. The Chess Pieces and Dream throw out plenty of variety of atmosphere and, within the confines of a cool shadowed world, exploit the confiding and orating of Aaron Larget-Caplan’s guitar. Six Melodies for violin and guitar are a shade, but often only a shade, more complicated. After six tracks of Cage, the tunefully atmospheric music-smith, one’s mind and ears are ready for the Melodies‘ gloriously creaking match and mismatch carried by violin and guitar. These Melodies, mercurially varied and each radiating the feel of a journey, occasionally carry the suggestion of baroque Iberian courts. In a Landscape is an interplay of shadows, dripping archways and rilled watercourses. The music here is about patiently moving water rather than torrents; it would make a tasty companion to Rodrigo’s Aranjuez concerto. Bacchanale revels in discontinuity including deadened wood-splintering resonances. Somewhere in the mix is the sound of the koto for which Cage’s similarly inclined friend, Henry Cowell, wrote a concerto premiered by Eto Kimei and conducted by Stokowski in 1964. 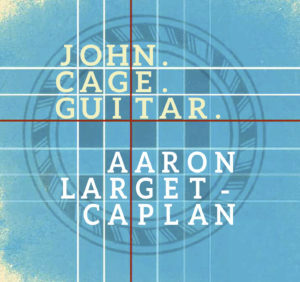 The notes, which address the individual works, Cage from various perspectives and artist profiles are by Aaron Larget-Caplan. This disc, quite properly, knows no fear in its blend of delicacy, complexity and amiable simplicity.